Ever since she was a child, Angela Pruitt has been fond of gardening. She was introduced to it through her grandmother, who lived in Robbins, Illinois, which is just outside Angela's hometown, Chicago. Little Angie, her 15 siblings and her friends, would play outside all day, and when they were hungry, they'd pluck fresh fruits and vegetables from the neighbors' gardens. Her grandmother's plots of plump tomatoes, hardy potatoes, and sweet corn gave Pruitt precious hope. But Pruitt did not know that you could grow vegetables within city boundaries because she had never seen it done. Upon moving to Milwaukee, Pruitt was excited to set her roots deep into the community. At first she rented but soon she became a homeowner. 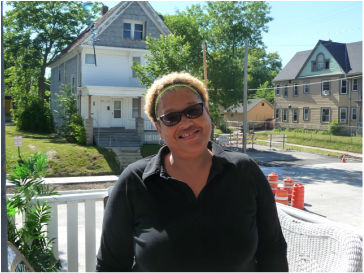 She worked with Habitat for Humanity to rehabilitate an older house in the Washington Park neighborhood. Pruitt recalls the intimidating feeling when she took a look at that burnt, broken down mess that was going to become her home. But, she loved what it could become and imagined the life she desired. Pruitt and her six children put in 500 hours of sweat equity as a down payment. She decided to keep a door, an original piece of the duplex that was there before she moved in. A child who use to live in this building had written something on it. Pruitt preserved this door for its symbolism: This original door represents where she was and how far she had come in life. Pruitt's faith in God started to wake her up from that five-year slumber. She was tired of coming and going. Believing that a key to a healthy community is stewardship, she decided to get started again. To her, God gave us the earth in all of its glory. He wants us to take care of it and share it at its best. She decided to work with students from Marquette who partnered with an organization called Safe and Sound. The students knocked door to door in order to get neighbors to help with a community clean-up. It was a success! Erin from Safe and Sound introduced her to Phoua Vang, who is a part of Washington Park Partners. From then on, Angela wanted to learn how she could re-introduce herself to the community. She came up with many ideas such as a community drive-in theater and community gardens.